Sorry! Yeye Teish's Master Class has already happened. This class connects the activities of the Autumn season, the harvest, with the gifts of our ancestral inheritance, our bodies, and our cultures. Yeye Teish shares several personal stories of the garden as a place of transformation where mysterious encounters with the ancestors can occur. We will draw upon works from Teish's books Jambalaya and Carnival of the Spirit to engage in exercises that help us to reconnect with the energies of the season. 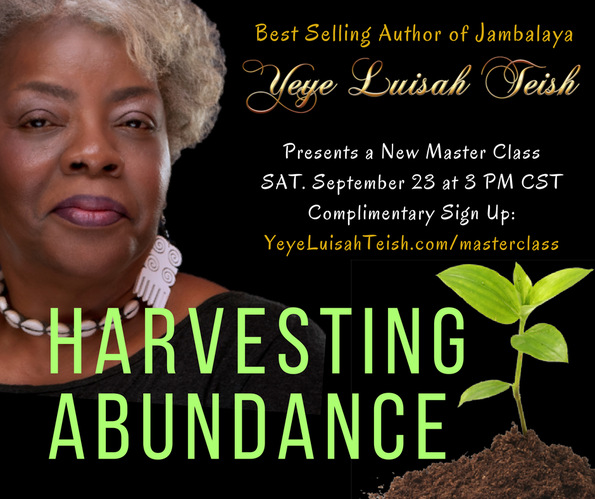 Participants are invited to perform the rituals of feeding the earth, pouring money, and giving gratitude to the ancestors. This Master Class includes visualization, storytelling, song, and ritual instructions. I'll meet you in the cabbage patch.